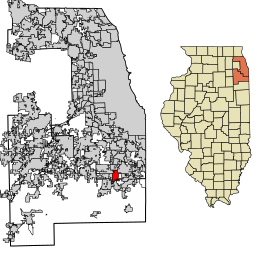 Location of Park Forest in Cook County, Illinois. Developers Nathan Manilow, Carroll F. Sweet and Philip M. Klutznick held a press conference in the Palmer House in Chicago on October 28, 1946, to announce the planned development of a new self-governing community in Chicago's south suburbs. This project, soon to be referred to as Park Forest, was to be developed by American Community Builders (ACB). The village of Park Forest was partly designed by town planner Elbert Peets in the tradition of planned communities around the nation to provide housing for veterans returning from World War II. Studs Terkel, in his oral history of World War II, The Good War, says Park Forest and other such middle-class suburbs grew out of the new prosperity after the war. First he quotes an unnamed GI, "The war changed our whole idea of how we wanted to live when we came back. We set our sights pretty high. . . . I am now what you'd call middle class." Terkel goes on: "The suburb, until [about 1946], had been the exclusive domain of the 'upper class.' It was where the rich lived. The rest of us were neighborhood folk. At war's end, a new kind of suburb came into being. . . . Thanks to the GI bill, two new names were added to American folksay: Levittown and Park Forest. "A new middle class had emerged. Until now, the great many, even before the Depression, had had to scuffle from one payday to the next. . . . [Before there had only been one] car on the block. Now everybody was getting a car. Oh, it was exciting. (Terkel, p. 12)"
Park Forest was honored in 1954 as an "All-America City" for its citizens' help in the creation of Rich Township High School, on Sauk Trail. It was awarded this same honor again in 1976 for open housing and racial integration and initiatives. A village landmark was the Park Forest Plaza, an outdoor regional shopping center of over 50 stores and restaurants which included Sears, Marshall Fields and Goldblatt's. In 1956, William H. Whyte, an editor at Fortune magazine, published a book called The Organization Man that defined the nature of corporate life for a generation. The book described how America (whose people, he said, had "led in the public worship of individualism") had recently turned into a nation of employees who "take the vows of organization life" and who had become "the dominant members of our society". Park Forest was one of the communities that figured most prominently in Whyte's study of the home life of "the organization man," and should be read by anyone seeking an insight into early Park Forest. In 1951 and 1957, synagogues opened in Park Forest as Jews became 15% of the population. By 2013, both synagogues had moved outside the town. Although officially desegregated from its inception, Park Forest's first African-American family took residence there in 1959. Park Forest is known for the "Scenic 10", a 10-mile (16 km) race held annually on Labor Day that attracts runners from around the globe. In 2008, the race was shortened to a 5-mile (8.0 km) course to attract more local runners and renamed the "Scenic Five". On March 26, 2003, a meteor exploded over the Midwest, showering Park Forest with dozens of meteorite fragments. These fragments are currently on display at the Field Museum in Chicago. For further reading see Park Forest (meteorite). According to the 2010 census, Park Forest has a total area of 4.96 square miles (12.85 km2), all land. The village is generally bounded by U.S. Highway 30 on the north, Western Avenue on the east, Central Park Avenue on the west and Thorn Creek on the south. Parts of Park Forest are east of Western Avenue, however, including a subdivision called "Eastgate". Park Forest is bisected by the Elgin, Joliet and Eastern Railway (now the Canadian National Railway) double-track main line, which was paralleled a little further north by the Michigan Central (New York Central) railroad. That rail line has been converted to a nature trail called Old Plank Trail. The beginning of the trail is at Western Avenue, and it runs through Park Forest west to Joliet. The village is hilly. This is especially evident in the Forest Preserves scattered around and near the village. The land is characteristic of steep ravines and hills. Also, near or bordering the village is Sauk Lake, bordered by steep, sandy bluffs on each side. The village borders the Valparaiso Moraine. As of the census of 2010, there were 21,975 people, 8,750 households, and 5,497 families residing in the village. The population density was 4,430.4 people per square mile (1,716.8/km2). There were 9,838 housing units at an average density of 1,983.5 per square mile (768.6/km2). The racial makeup of the village was 33.4% White, 59.8% African American, 0.3% Native American, 0.8% Asian, 0.05% Pacific Islander, 2.1% some other race, and 3.6% from two or more races. 6.4% of the population were Hispanic or Latino of any race. There were 8,750 households, out of which 33.8% had children under the age of 18 living with them, 33.6% were headed by married couples living together, 24.0% had a female householder with no husband present, and 37.2% were non-families. 33.2% of all households were made up of individuals, and 12.8% were someone living alone who was 65 years of age or older. The average household size was 2.46, and the average family size was 3.15. In the village, the population was spread out with 25.9% under the age of 18, 8.0% from 18 to 24, 26.4% from 25 to 44, 27.1% from 45 to 64, and 12.7% who were 65 years of age or older. The median age was 37.4 years. For every 100 females, there were 81.4 males. For every 100 females age 18 and over, there were 75.6 males. For the period 2009-11, the estimated median annual income for a household in the village was $45,925, and the median income for a family was $53,977. Male full-time workers had a median income of $41,976 versus $36,451 for females. The per capita income for the village was $21,149. 18.8% of the population and 14.4% of families were below the poverty line. Out of the total population, 27.7% of those under the age of 18 and 11.5% of those 65 and older were living below the poverty line. 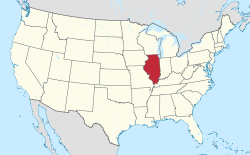 Park Forest is in Illinois' 2nd congressional district. In celebration of the 2018 Illinois Bicentennial, the Park Forest was selected as one of the Illinois 200 Great Places  by the American Institute of Architects Illinois component (AIA Illinois). ^ a b c d "Profile of General Population and Housing Characteristics: 2010 Demographic Profile Data (DP-1): Park Forest village, Illinois". U.S. Census Bureau, American Factfinder. Retrieved March 18, 2013. ^ "NOWData - NOAA Online Weather Data". National Oceanic and Atmospheric Administration. Retrieved April 16, 2019. ^ "Selected Economic Characteristics: 2009-2011 American Community Survey 3-Year Estimates (DP03): Park Forest village, Illinois". U.S. Census Bureau, American Factfinder. Retrieved March 18, 2013.